Betty Peters bought this postcard at a collectors’ show earlier in August and wonders when the photo might have been taken, and where. 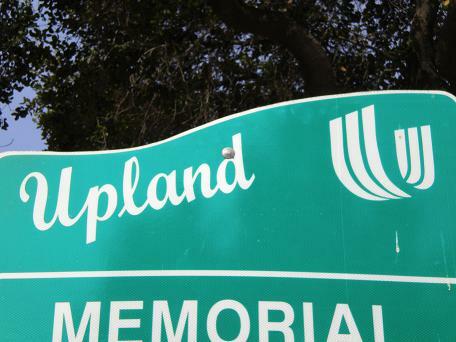 Euclid’s a long avenue, after all, traveling from Chino through Ontario and Upland and into San Antonio Heights. I know, it says it’s a Daily Report photo, but we don’t have any archives other than microfilm from those days. My colleague Joe Blackstock can’t immediately recall, in his joking words, “the great snowstorm of ’45” or some other such meteorological event. 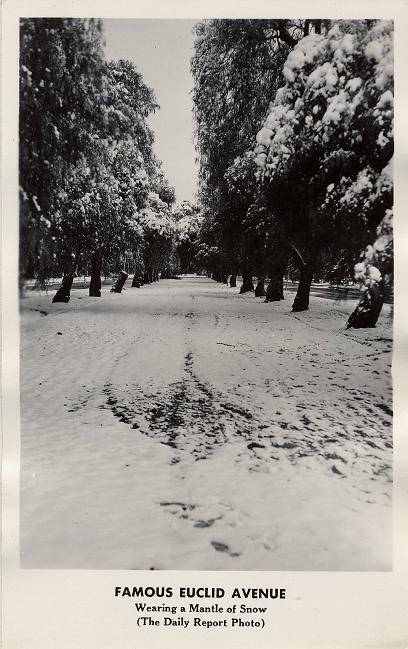 But he says snow isn’t uncommon in Upland’s northern reaches, which is where I’d guess the photo was taken. This weather report has been brought to you by the Jones Galoshes Co.
* UPDATE: See Gavin’s response in the comments section for the apparent answer to this minor mystery. He’s the Sherlock Holmes of local precipitation. 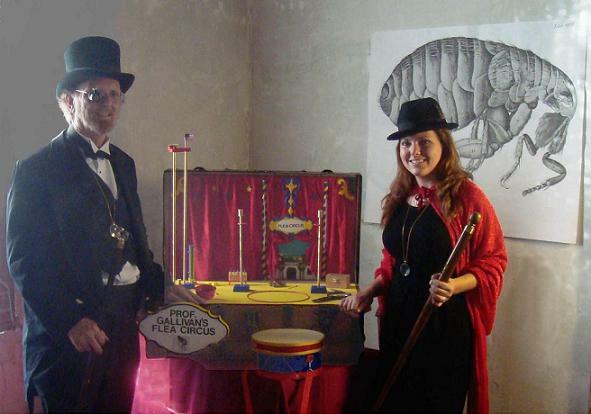 Jim Gallivan and his wife, Mickey, are integral to documenting and saving Pomona history, and Jim has an interest in the 19th century pseudo-science of phrenology. Thus I was delighted, but not entirely surprised, when Jim sent me the above mock-Victorian photo in response to my column last week about my little flea problem at home. “However, one trait of the Pulex irritans is that they take on the owner’s traits. Seeing how one of the features of our circus is a parade and we even have have a car, single-flea powered, I was wondering if you might be able to spare one of your talented fleas to lead the parade and wave. Jim, you’re welcome to one of my fleas. In fact, purely to make things simpler for you, feel free to take several so that you can do auditions and pick the best for your purposes. No, I insist. Some people think Claremont only sells expensive frou-frou items. But according to City Manager Jeff Parker’s weekly report (kindly forwarded by reader Phil Carty), City Hall is now pushing a consumer product at a rock-bottom price. Claremont residents only, eh? Ha ha, you Uplanders will have to look elsewhere for your free rock. Now how much would you pay? Unless you’re anti-sustainability, visit the lot in the 4100 block of Padua Avenue. At left is the clipping referenced in today’s column about the June 16, 1939 preview of “The Wizard of Oz” at Pomona’s Fox Theater, two months before its premiere. The writer, “O.H.K.,” seems to be kind of a fuddy-duddy as far as children are concerned. If even the tornado is too scary, we can imagine what he/she must have thought of the flying monkeys! With the review’s criticism of how the movie, unlike the book, “leaves nothing to the imagination,” I can’t help but wonder, in all seriousness, if the writer was a teacher or children’s librarian who wasn’t keen on movies to begin with. Note that “songstress” Judy Garland attended the preview screening. Another celebrity sighting for the Fox record books! Here’s a link to the Wonderful Wizard of Oz website also cited in my column. It’s a lot of fun to poke around on — the FAQ section contains lots of fascinating tidbits, and in a very readable way. This link is to the portion of the FAQs about its premiere, outtakes, flubs and initial reception. The Internet Movie Database has a good trivia section on the movie too. A tip of the Tin Man’s metal cap to Fox co-owner Ed Tessier for providing a copy of the clipping. The library’s microfilm collection is missing that portion of 1939 and so are the Daily Bulletin’s archives. * Curious about the “jitterbug” scene cut from the movie prior to Pomona? Reader Derek Deason found a short video clip giving an idea of what was cut. L.Y.L. opened in April, replacing Captain KJ’s in the former China Star location at the west end of the Sprouts center. To my knowledge, this is the only sit-down Chinese restaurant in Claremont. I’m afraid my city is awfully light on one of the world’s most popular cuisines. A reader whose name I’ve misplaced (sorry) said I should give L.Y.L. a try, saying he gets takeout from there frequently. And so I invited a couple of foodie friends to lunch there the other day. Sadly, she was right. All the popular non-Chinese Chinese items filled the lunch menu, which has a page of $5.95 combos and a page of $6.95 combos. Yes, orange chicken is among them. So much for my hopes, based on the restaurant’s unusual name, that this would be a more authentic Chinese experience. That said, the food was competent and plentiful. The combos come with soup (in our case, a decent hot and sour), an egg roll (mediocre) and either rice or lo mein. I got the lo mein, which made me the envy of my friends, who’d ordered rice. They ordered string beans and chicken with cashews (each $5.95) and the big spender (me) got scallops with garlic sauce ($6.95). They liked their combos okay but thought the rice portion was undersized. My entree was all right but nothing special. Two of us had leftovers, so the price-per-meal was right. The L.Y.L. interior is very different from the China Star days, and arguably better: Rather than pleasant but dull cushioned booths, the seating is small wooden tables and a few wooden booths separated by paper screens. The false ceiling is gone, exposing steel beams from which hang paper lanterns and fashion lighting. L.Y.L. 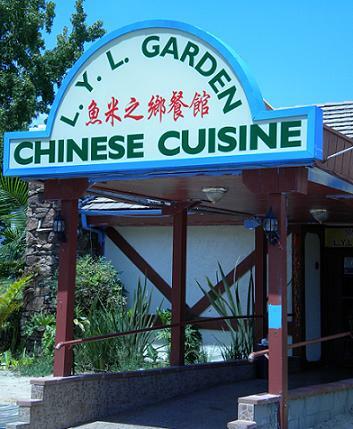 may prosper because I don’t think there’s another Chinese restaurant for some distance — maybe La Verne’s Chinese Pavilion. 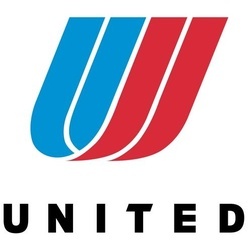 Uh-oh. A closer look shows the storefront is cleared out. A clerk at the comic shop said Tamale King left earlier this month. A December 2008 feature on the restaurant can be read if you click below. 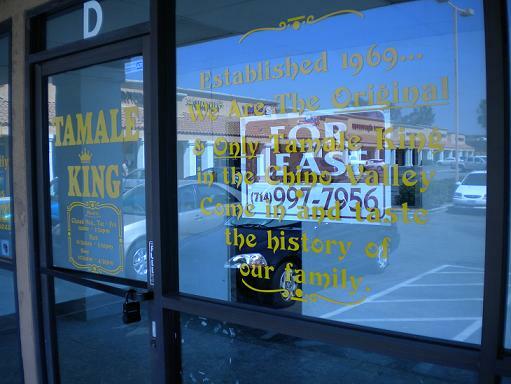 Is the “original and only” Tamale King really gone, and why? Ouch. Was it really that bad? Oh well. So much for Friday’s planned column on how I got up and took a shower. I’d been wanting to see the indie romance movie “(500) Days of Summer,” which was largely filmed in downtown L.A. and in which its classic architecture plays an important role, and had also been wanting to take the train to downtown L.A. again. When I saw that the movie was playing at the obscure Laemmle Grande 4-Plex at 3rd and Figueroa, the idea of seeing the movie downtown proved irresistible, even though it’s also playing in Claremont. So on Saturday I took the train to Union Station and the Red Line subway to the 4th and Hill stop. 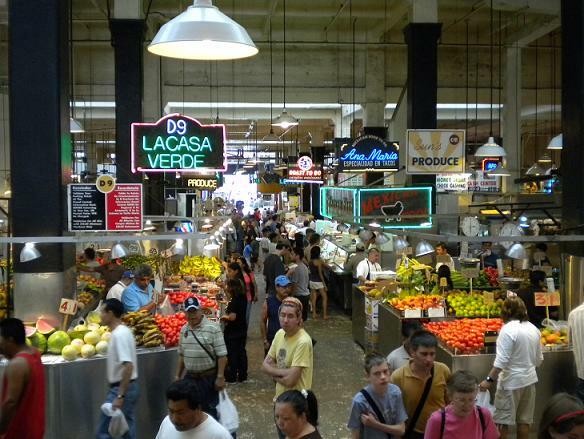 I had lunch at the Grand Central Market, the 1917-founded mecca of food vendors and produce stands. I got a smoothie at La Adelita and two tacos at Maria’s Fresh Seafood. 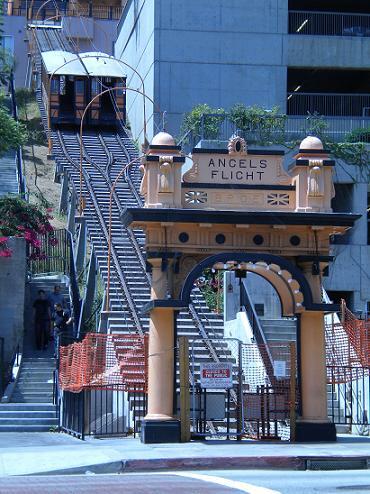 Across the street is Angels Flight, the short railway dating to 1901 that hauls people up and down Bunker Hill. Alas, Angels Flight is still out of commission, as it’s been since a fatality in 2001, although its return seems poised to happen. I hoofed it up the stairs by the railway and took a break on a bench at Angelus Plaza. Not the right bench, as it turned out. A couple of crucial scenes in the movie, which I saw afterward, are set in the park, but the bench the characters sit on is a different one with a better view. Oh well. Making your way through Bunker Hill as a pedestrian isn’t simple, what with the varied elevations and fortress-like architecture, but the utopian-styled plazas seemed more lovable as I traversed them on foot. Eventually I located the subterranean theater next to a Marriott. The theater itself seems like a ’70s relic with a musty smell and floor-to-ceiling curtains separating the thin-walled auditoriums. Afterward, I walked up Figueroa past the Music Center and the weird new high school by the 101 to Chinatown, and then east to Union Station for the ride home. How was the movie? Like Grand Central Market, Metrolink and downtown, highly recommended. I did indeed, something like six years ago. Gad, what a memory some of you have.